Despite constituting the most popular hike in the park, what Alberta Falls lacks in solitude it compensates with beauty. Just 0.8 mi. up the trail, roaring Glacier Creek catapults 25 feet at the falls as it cuts through Glacier Gorge. 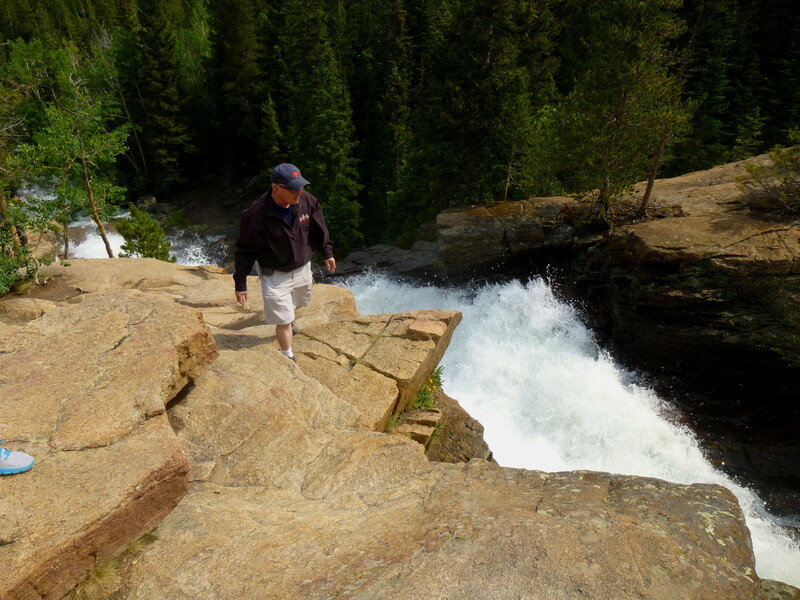 A leisurely hiker can reach Alberta Falls in about 30-45 minutes, as the 220-foot ascent is mostly gradual. As with most hikes, it is best to view in the morning or evening, when the crowds are thin. With my family, we hiked to Alberta Falls late on a Saturday morning after coming down from Bear Lake. As expected, the rocks around the falls were crowded (perhaps 30 or so people), but there was still room to breathe. 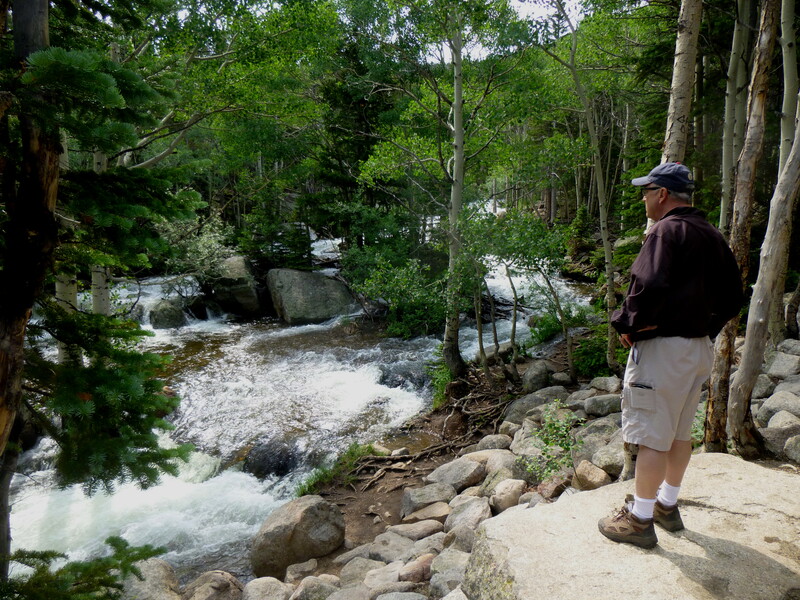 Usually the hike to the falls would begin at Glacier Gorge Trailhead, though we came from Bear Lake (a 0.5 mi. downhill walk through forest). This gave us a quarter mile head start over the others trekking up from Glacier Gorge parking area. From this junction, the well-worn trail (normally about 4-5 feet wide and relatively rock-free) climbs intermittently through the trees. After skirting a ridge, the route briefly dips down to meet up with Glacier Creek, a little over a half mile from the start. Here the rapids are already roaring, and this spot is a popular area for a snack or picnic. Again the trail veers off to the right and climbs another quarter mile to the falls. 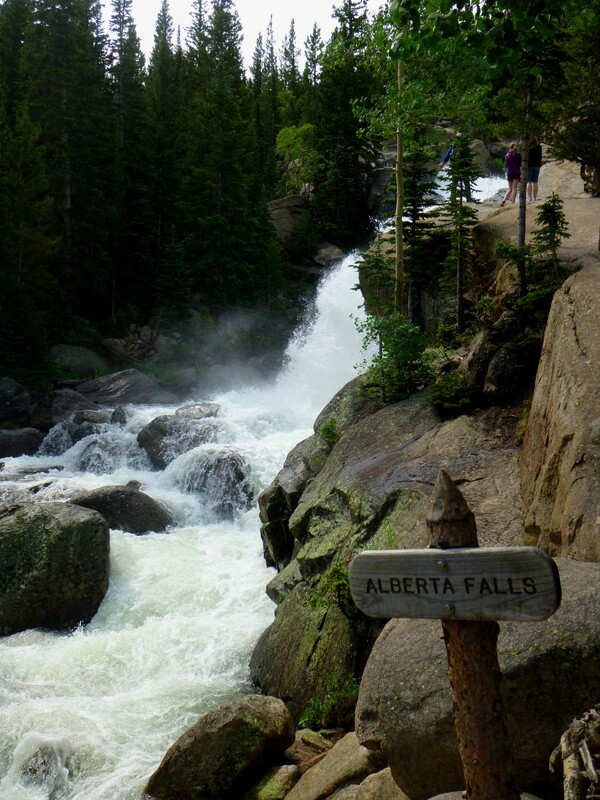 The best view of the entire chute is from down below, next to the “Alberta Falls” sign. Curious hikers can then scramble up farther to the top of the falls with relative ease, leaving the trail (which continues on to Mills Lake, Loch Vale, etc.) off to the right. Vistas from the top of the falls are tremendous, with Glacier Gorge and Glacier Basin coming into full view to the north. 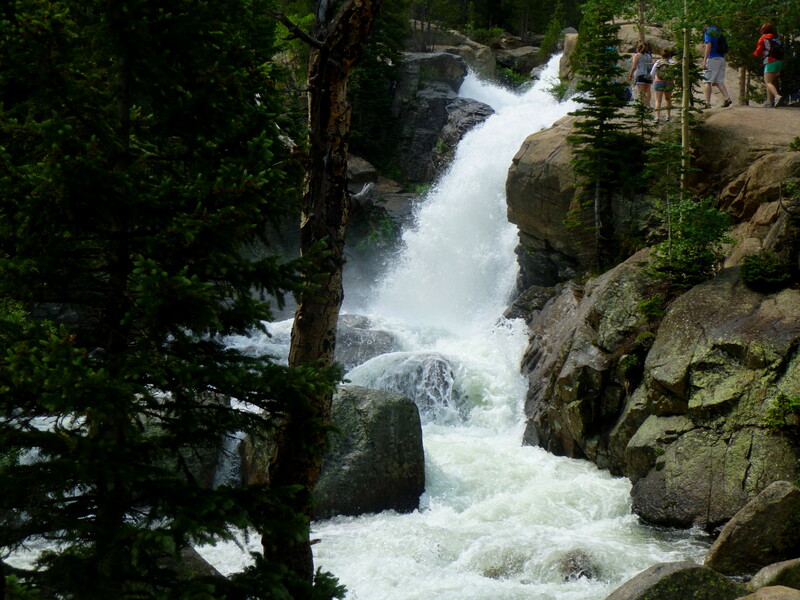 This entry was posted in Colorado, Easy Hikes, Rocky Mountain National Park and tagged Alberta Falls, Colorado, Glacier Basin, Glacier Creek, Glacier Gorge, Rocky Mountain National Park, waterfall. Bookmark the permalink.